Publisher: Jonathan Cape, 1960. First edition. Condition: Extremely large hardcover with dust jacket. Scratches and small closed tears to dust jacket, book in generally good condition with slight tanning to endpapers. Inscription on ffep. With 98 photos. Overseas shipping will cost extra. 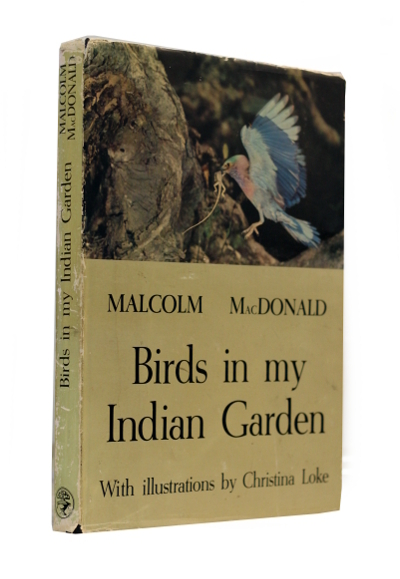 A large, heavy book on the birds of Delhi written by Malcolm MacDonald, who was the Governor General of Malaya and Commissioner General for Southeast Asia from 1948-1955, and the High Commissioner in India from 1955-1960. 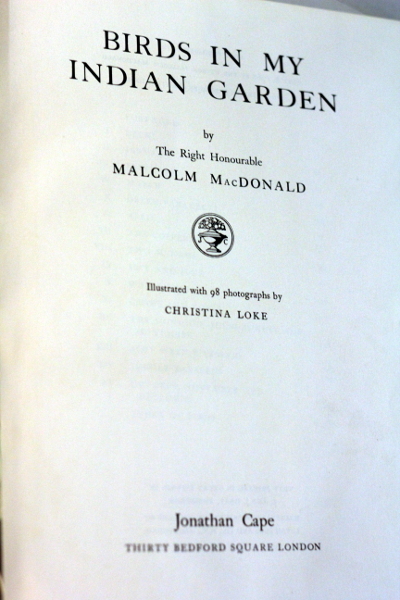 The 98 photographs in the book were taken in MacDonald’s garden in Delhi, as well as in Nehru’s residence and others locations mostly around Delhi. The photographer was Christina Loke, the second wife of Loke Wan Tho, the founder of Cathay Organisation. 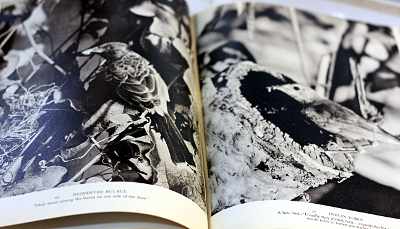 One is tempted to assume that the lovely photographs, an achievement of artistry in the depth of tone in only black and white (by Christina Loke) are enough to stamp this book as unusual. But when you add to that a text written by the then High Commissioner of India, a lovely evocative piece of writing, highly informative and warmly personal, you have a choice acquisition. Two hours before breakfast — and the area comprising his own residential gardens in Delhi — these were the boundaries of his observation. 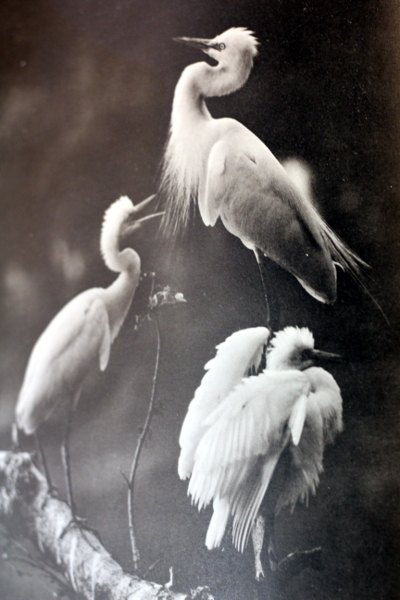 And into this he has been able to record some 136 species, thirty of which nested on the premises; and to share with his readers his observations through the seasonal round, of courtship, mating, nest building, hatching and training of young, as well as to describe the visitors to his three acres. 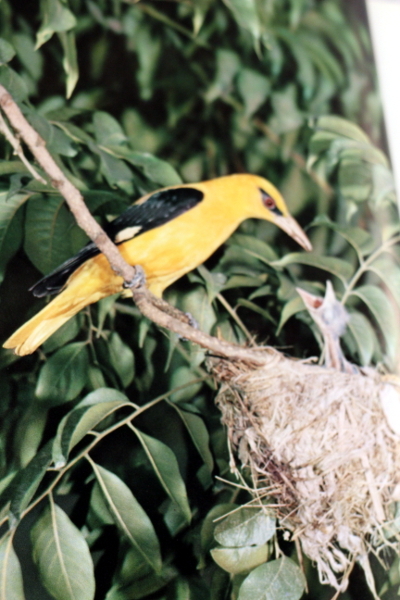 Between the monthly records are chapters devoted specifically to green parakeets, coppersmiths, mynahs, white eyes, crows and koels, ashy wrens, warblers and jungle babblers. At the end there is an index giving both Latin and Hindi names.